China opposed protectionist measures of the United States at the 23rd China-US Joint Commission on Commerce and Trade (JCCT) that opened in Washington on Tuesday. Many Chinese companies have encountered “national security checks” in the US, which have blocked their investment activities alleged the spokesman for the Chinese Ministry of Commerce (MOC) Shen Danyang. “We hope the US authorities can treat Chinese investors in an objective way, keep political elements away from business cooperation, and ensure the security checks are open, fair and transparent,” he said. Chinese investment in the United States reached 1.81 billion US dollars in 2011. 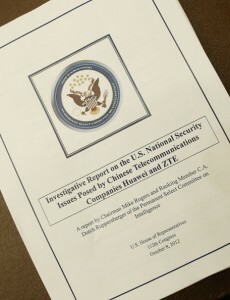 United States had earlier warned that Huawei and ZTE, two leading Chinese technology firms pose potential threats to its national security. Huawei and ZTE have already become Cisco’s major competitors. But both of them hit an invisible wall when they attempted to expand their business in the United States. China’s Foreign Ministry has repeatedly urged the US to “set aside prejudices” regarding the two firms. Earlier this year in October, the US President signed an order blocking a deal by a Chinese firm, Ralls Corp, to acquire four wind farm projects near a US naval facility in Oregon.